Excel FR® Flame-resistant, 12.5 oz. 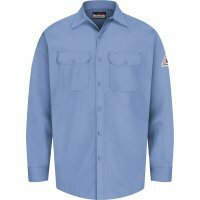 Excel FR® Flame-resistant, 14.75 oz. Excel FR® Flame-resistant, 5.25 oz. Excel FR® Flame-resistant, 7 oz. 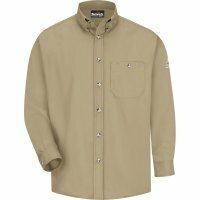 Westex Ultrasoft® Flame-resistant, 11.0 oz. Westex Ultrasoft® Flame-resistant, 7 oz. 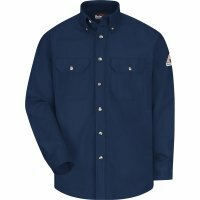 Westex Ultrasoft® Flame-resistant, 9 oz. NFPA® 2112 Compliant Banded topstitched collar. Two chest pockets with button flap closures and sewn in pencil stall. Placket front with button closure. Tailored sleeve placket. Topstitched cuff with button closure. 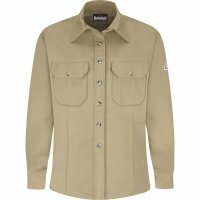 Fabric: Flame-resistant, 4.5 .. Banded, top-stitched, button-down collar. One chest pocket with button closure and sewn-in pencil stall. Placket front with button closure. Top-stitched cuff with button closure. Tailored sleeve placket. Fabric: Flame-resistant, 5.25 oz. (180 g/m..
NFPA® 2112 Compliant Lay-flat collar. Hemmed front with closures. One-piece lined cuffs with closures. Sleeve vents. Two chest pockets with button flap closures and sewn-in pencil stall. Fabric: Excel FR® Flame-resistant, 7 oz. 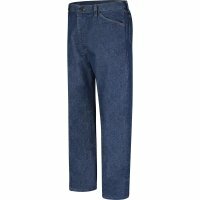 (235 g/m²) Blen..
Classic Fit Pre-Washed Denim Jeans - Excel FR® - 14.75 oz. 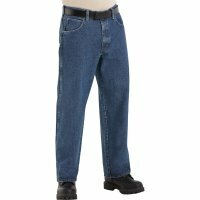 NFPA® 2112 Compliant Five jean-style pockets. Two-needle felled seam construction. Sits at natural waist. Relaxed seat and thigh. Soft pre-wash for comfort and look. 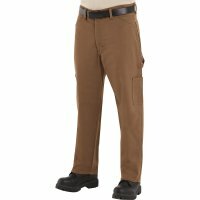 Fabric: Flame-resistant, 14.75 oz. 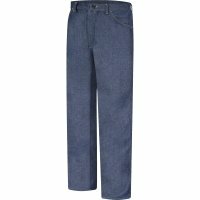 (500 g/m²) Blend: 100% Pre-Washed Cotton D..
Dungaree - Excel FR® ComforTouch® - 11.0 oz. NFPA® 2112 Compliant Waistband with button closure. Two slack-style front pockets. Left hip pocket with button closure. One-piece waistband with button closure. Five jean-style pockets. Rule pocket and utility pocket on right leg. Hammer loop and ut..
Jean-Style Pants - Excel FR® - 9 oz. NFPA® 2112 Compliant Waistband with button closure. Two slack-style front pockets. Left hip pocket with button closure. One-piece waistband with button closure. Five jean-style pockets. Two-needle felled seam construction. Fabric: Flame-resistan.. Loose Fit Stone-Washed Denim Jeans - Excel-FR® - 14.75 oz. NFPA® 2112 Compliant Five jean-style pockets. Two-needle felled seam construction. Sits below natural waist. Loose seat and thigh. Wider leg opening than classic fit. Soft pre-wash and stone-washed fabric for comfort and look. 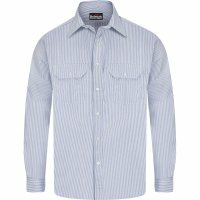 Fabric: Flame-resi..
NFPA® 2112 Compliant Banded, button-down collar. Tailored sleeve placket. Topstitched cuff with button closure. Button-front placket. Full underarm gussets. Fabric: Flame-resistant, 7 oz. 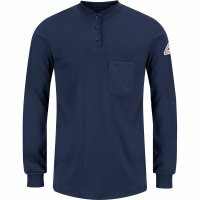 (235 g/m²) Blend: 88% Cotton/12% Nylon Protection: Ar..
NFPA® 2112 Compliant Three button placket. Knit henley collar. Rib-knit cuff. Single spade chest pocket. 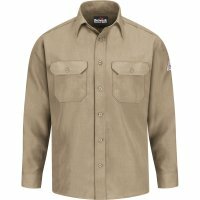 Fabric: Flame-resistant, 7.25 oz. (245 g/m²) Interlock Blend: 100% Cotton Protection: Arc Rating ATPV 9.6 calories/cm² This flame-res..
Men's Work Pants - Excel FR® - 9 oz. NFPA® 2112 Compliant Waistband with button closure. Two slack-style front pockets. Left hip pocket with button closure. Fabric: Flame-resistant, 9 oz. (305 g/m²) Twill Blend: 100% Cotton Protection: Arc Rating ATPV 11 calories/cm² This fl.. Relaxed Fit Denim Jeans - Excel FR® - 12.5 oz. NFPA® 2112 Compliant Five jean-style pockets. Two-needle felled seam construction. Sits at natural waist. Relaxed seat and thigh. Straight leg opening. One-piece waistband with button closure. Fabric: Flame-resistant, 12.5 oz. (425 g/m²) Blend.. Banded, top-stitched, button-down collar. One chest pocket with button closure and sewn-in pencil stall. Placket front with button closure. Top-stitched cuff with button closure. Tailored sleeve placket. Fabric: Flame-resistant, 7 oz. 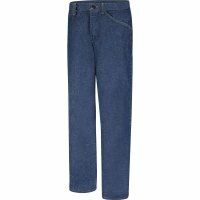 (235 g/m²) ..
Women's Classic Fit Pre-Washed Denim Jeans - Excel FR® - 14.75 oz. NFPA® 2112 Compliant One-piece waistband with button closure. Five jean-style pockets. Twon-eedle felled inseam construction. Soft pre-wash for comfort and look. Updated fit. Classic fit is traditional, sits at the natural waist and has a slimmer le..
NFPA® 2112 Compliant Banded, topstitched collar. Cuffs with button closure. Button-front placket. Fabric: Flame-resistant, 7 oz. (235 g/m²) Blend: 88% Cotton/12% Nylon Protection: Arc Rating ATPV 8.6 calories/cm² This flame-resistant garm..
Women's Work Pants - Excel FR® - 9 oz. 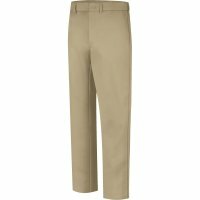 Work Pants - Excel FR® ComforTouch® - 9 oz. NFPA® 2112 Compliant Waistband with button closure. Two slack-style front pockets. Left hip pocket with button closure. Fabric: Flame-resistant, 9 oz. 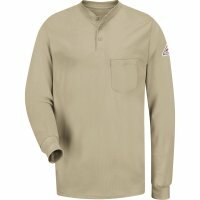 (305 g/m²) Twill Blend: 88% Cotton/12% Nylon Protection: Arc Rating ATPV 12 calories/cm² ..